Leadership is a little like downhill skiing. Three years ago, my wife’s side of the family skied in Park City, Utah for 4 days. This past week, I spent a week in Steamboat Springs, Colorado with my wife and kids. Man, what a difference. Three years ago, I kept telling myself to get ready. I knew I was out of shape. I hadn’t skied in 25 years, but I just kept putting it off, you know, because I was so busy. Then, suddenly it was time to go. As a result, I only skied for about 3 hours on two of those days, then I was spent. I must say, after the first time down the mountain I swear someone was stabbing a thousand pins in my thighs. If you want to experience it, just do that exercise where you sit against a wall (without a chair, of course) until you start to feel the burn, then stay there until it becomes excruciating. Then do it over and over… and over. 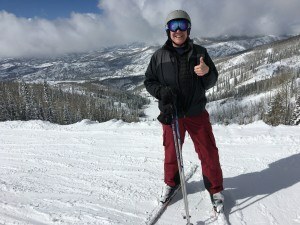 This week, I skied three days in a row and could go another day or two (ok, maybe just one). Yeah, I’m tired and sore, but not completely wiped out like last time. What was the difference? One simple thing. This year was so much better, because last August I started exercising regularly. At the time, I didn’t even know we would be skiing in the spring. I had just finally had enough of being out of breath when I walked up the stairs. And I only exercised 12 minutes a day for 4-5 days a week. Does that even count? 12 minutes every other day on an old Schwinn Airdyne? 1 minute warmup, 10 minutes riding as hard or easy as I felt like that day, and 1 minute cool down. How could that help? Well, it was enough to make all the difference for this trip. Oh, and I lost 12 pounds and a couple inches around my waist in the process. Win, Win, Win. Then I thought, this is just like leadership! You do some small thing almost every day, just because you know it is the right thing. Maybe it is “walking the floor” once a week, or a once a month brown bag lunch with the CEO. Then, the day comes when your business is facing a major challenge and you need the support of your employees or direct reports. And because you have invested small amounts of time in them, they are willing to sacrifice for you. Sure it is still a challenge. And you’re still tired at the end of the day, but you manage the crisis so much better than you would have, if you hadn’t spent those bits of time working on the relationships. Of course there are days you don’t want to have lunch because you have so much to do. Or you don’t want to walk the floor this week because you had spent so much time in meetings and you are exhausted. But you do it anyway. And when you really need it, the reserves are there. So, persevere. Keep putting in the time, energy and effort, even when you can’t see the payoff, when you are exhausted and want to skip it “just this once.” Because, you never know when you are going to need to draw on those reserves to see you through. Have you had a time where you needed the extra help? Tell us about it. So true Jeff. It’s amazing how the little things add up. About 25 years ago I started writing in the mornings. I’m a morning guy, and at the time we owned a clothing store, so I used to get up and go straight to work on business related stuff. Truth was, I wanted to be a songwriter, not a retailer, so it was a huge shift to honour my desire to write, and give it the best moments of the day. A few degrees of change in the trajectory of a missile lands you in a whole different place over the long term. Pleased to say I’m no longer in retail! Lowry, you are an inspiration to all to follow their dreams and passions and make a living at it. Your discipline and honoring your desire to write certainly paid off. I am working into that habit myself. Look forward to seeing you again soon, my friend. What happens when you don't plan ahead - THE HUMAN LEADER on WHERE DID THE SUMMER GO? Copyright © 2017 Dr . Jeff Van Meter . All Rights Reserved.